The Nebra disc is currently the oldest known representation of the celestial sky. This was a phenomenal archaeological discovery that took place on Mount Mittelberg, near Nebra (Saxony-Anhalt, Germany) during 1999. It has been shrouded in mystery and controversy since its discovery and it has even been suggested that its design is of extra-terrestrial origin. A team of looters who were looking for old ammunition and military weapons, discovered, with the help of illegal metal detectors, the remains of a prehistoric settlement that would later be dated to around 1600 years BC. The disc has been associated with the Bronze Age Unetice culture. Location where the Nebra Sky Disk was first found. Location where the Nebra Sky Disk was Found on the slopes of Mount Mitteleberg. Their findings were as follows: The disc stuck vertically on the ground, 2 swords, 2 axes, some bracelets and a chisel. All of these items were surrounded by large stones that protected the area where they’d been deposited. In Germany, these types of private finds are illegal and must be handed over to a museum. This failed to appeal to the looters who, despite its incalculable historic value, sold all the treasures on the black market during 2000 for the sum of £13,000. That buyer, in turn, tried to sell the artefacts to the prehistoric museums of Berlin and Munich. 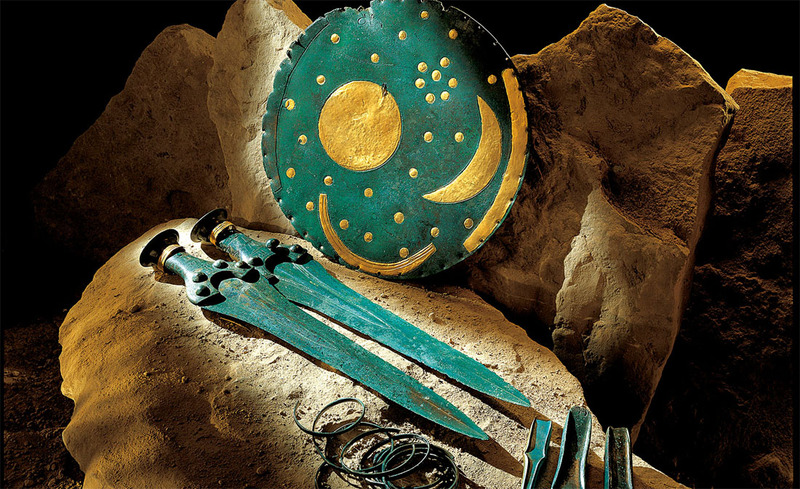 It was then that the director of the Berlin museum, Wilfried Menghin, received some photos in which he saw the rather dirty Nebra Celestial Sky Disc and some other relics. The asking price for these looted items had now jumped to £200,000. Menghin responded that the legitimate owner of the prehistoric treasure was Germany as a nation and that the items legally and morally belonged to the Museum of Prehistory in Munich. The illegal seller was clearly disturbed by the conversation and the artefacts vanished again. 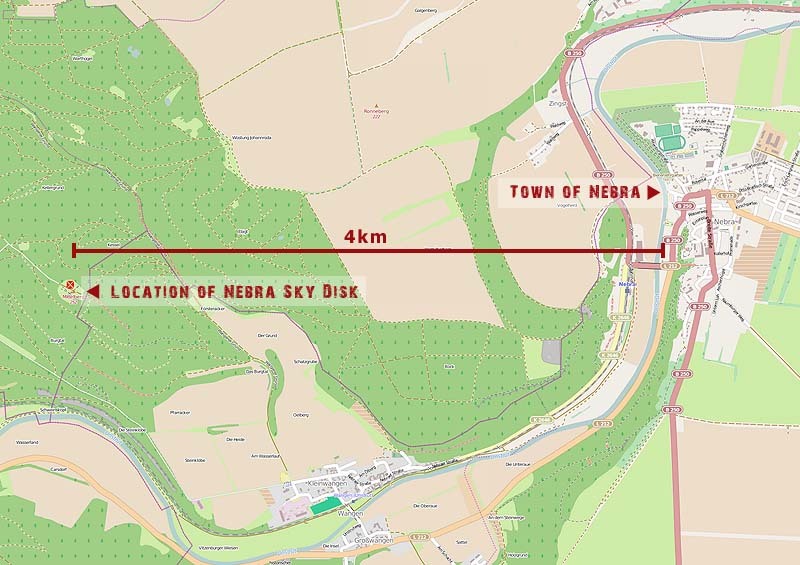 Two years later Menghin was approached with a similar proposition but this time the director of the museum did not want to lose track of the Nebra Sky disc again and went to the Ministry of Culture for Saxony-Anhalt and the matter was turned over to the police. The ensuing investigation initially turned up the Sky Disc and sometime later the remainder of the artefacts were also discovered and the looters arrested. 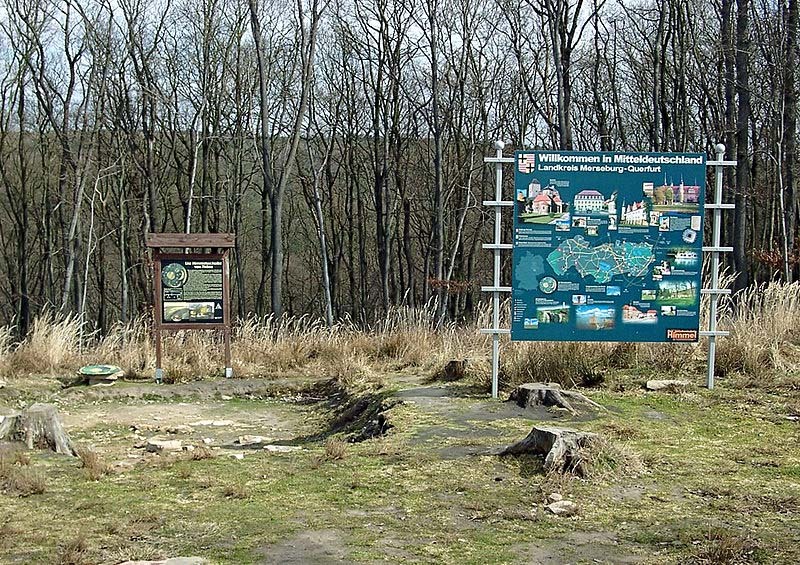 Possibly in exchange for a lenient sentence, the looters confessed the location of the find to be the forest of Ziegelroda on the slopes of Mittelberg at a height of 250 metres. Chemical analyses of the soil found on the disk and the soil from the forest clearly confirmed that this was the original location of the discovery. 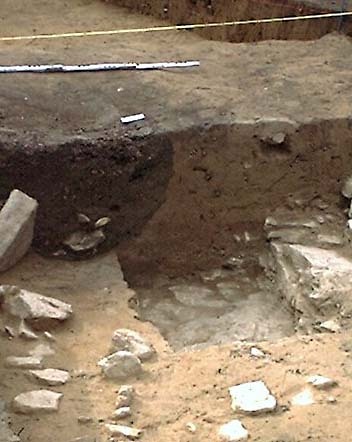 The federal office of Saxony-Anhalt the excavation of the site and obtained very good results. It was discovered that these had not been grave goods but a cache where the pieces had been randomly placed inside a metal container with a lid that was typically used to store precious objects. This type of deposit was quite frequent among people of the Bronze Age and archaeologists believe that they were probably offerings to the gods – although this is by no means certain. Around the time of the discovery some doubts were raised that such a sophisticated object as the Nebra Sky Disc could have been produced by the people from so long ago. Test were carried out and the specialists agreed that the green bubble shapes found on the surface of the copper carbonate disk could only have been created by a process requiring significant time. The Sky Disc was agreed to be authentic. It has a size of 31 by 32 cm and a thickness that increases from the outside to the interior, from 1.5 mm to 4.5 mm. It is arched and slightly concave and weighs just over two kilograms. Its original colour is unknown as after 3,600 years of being buried it has acquired a greenish coloration due to a patina of copper carbonate. It was found in the ground in an upright position with its obverse facing north. The gold ornamentation, impervious to corrosion, has not been degraded like the bronze. Research down on the Nebra Sky disc indicate that it was modified on at least three separate occasions. The time scale between modifications is unknown. The disk originally had thirty-two small round gold circles as well as a large crescent-shaped plate attached to the side. 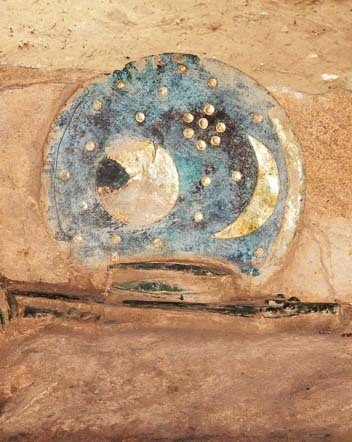 The section believed to represent the moon is depicted as an eclipse. A ‘sun boat’ depicted as an arc was added at a later date. At the time the Disc was concealed it had been modified again and had some thirty-nine or forty three millimeter (3mm) cut out around its perimeter. Their purpose is unknown.